Halfway through doing that with my tanker. I will be the first keeper of that. Yeah, it'd actually surprise me a great deal if it was the original engine. The truck doesn't actually have a logbook, nor show any signs of having plates on it; apparently it was pretty commonplace just to drive them around on trade plates up until the mid 80s or so, so it may never have actually been registered. Waiting to see whether the RLC Archive can find an ERM for it; if so, then I can hunt down a copy of the B vehicle card, for the date into service. The DVLA can be a funny animal to deal with and the paperwork you provide them with may not be the paperwork they want. I've been fortunate with my AEC tanker, the British Commercial Museum in Leyland, Lancashire holds all the build information I need and they are recognised by the DVLA. Is that the truck or yourself, then? The RLC isn't on the V765 list, and neither is the Bedford Owners and Enthusiasts Club, as far as I can tell. But I'll get a V55/5 ordered anyway; that way, it might be here by the time I get it done enough to start figuring out the paperwork nightmare. And of reversing hard against the handbrake while shoving of the transfer box lever to get it out of low. Our TAVR ones were always winding up whereas the ones at work (seismic exploration), which spent a lot of time in low box, never gave a problem. Oddly I am in the process of putting the same Harvey frost crane on a Bedford RL. I do not have a handle for the winch - any chance you could send me a photo of the winch handle? As most know - I am not a great fan of the DoT agencies - particularly what used to be VOSA! As Brooky says - get a letter from a club stating they have inspected the vehicle and it is what you say it is (hint - don't mention a % of parts age wise - I sent in a letter saying it was at least 60% tax exempt era parts - and they wrote back saying if they proceeded with that I'd have to pay tax, get a letter without the parts mentioned!) and it does have the chassis number as on the vehicle. As regards the club being on the approval list - ask about the two you mention. For my UAZ there was nothing dealing with Soviet vehicles on the list - MVT and IMPS passed due to lack of knowledge. However there was a club dedicated to Soviet era vehicles, the USSR - Unloved Soviet Socialist Register. I asked if they would accept a letter from them even though not in the list they had sent me and DVLA said yes. As long as it was on headed club paper. It might pay you to contact them via e-mail first explaining your situation. If you are lucky the query will get passed direct to the team that deals with this and all will go well. I'll get a few photographs (and measurements, if I can) of the winch handle(s) I've got, when I'm next in the yard; but it's a pretty simple thing, from memory... the most complex part is the dog on the end of it that connects up to the winch. That's a good thought; I'm sure it couldn't hurt to see what they say. Not much, at the moment. Buckled prop-shaft is out... At some point, when I'm closer to having it drivable, I'll drop it off somewhere to see what they say about making it more... er... prop-shaft shaped. I don't want to put the radiator back in until I've got an alternator fitted, simply because I have plenty of access and light without the radiator in the way; and I'm expecting some fiddling about making/tweaking brackets and such-forth to line up the pulley. Plus, this should prevent me causing damage to the radiator while trying to make everything fit. Not yet decided what alternator I'm going to use, but it'll probably be whatever's cheapest that I can get to fit. I can't foresee huge electrical demands, so something in the region of 55A will probably do just fine. After I get the alternator and electric fuel pump put in, radiator reinserted and plumbed, and enough of the rewiring done to get the important bits working; I'll see if I can get the engine to run on liquid fuel through the carb, and if successful, I will probably make a very slow and careful lap of the industrial estate. EDIT: Ooh! And if it moves under its own power, I can run it over the weigh-bridge and actually get a weight ticket for it. Hi. Good to see another RL saved! I have only just seen this thread so a bit late but in your first post you said you had 900 tyres on the truck but 1100 on the spares? If so, the 1100s will not be much use as they have a different number of stud holes to the 900s. Having 900s (particularly if you have twins on the back) shows it was a wrecker originally, strange that it lost its original crane?? I have a propshaft you can have, needs new bearings but at least it is straight! PM me if you are interested. I am in West Midlands. Interesting; I'd not counted the number of bolt-holes on the spares, I'll have to do that while I'm grabbing a winch handle to take pictures of. Memory says they're all 10-bolt, though; but it's been wrong before. Original recoveries with 9.00x20s were 8 stud but yours are clearly 10. The twins were fitted to give a greater load rating than a single 11.00x20. Yeah, checked this morning, and the wheels currently on the truck are ten-lug; as are the spares in the bed with the 11.00x20s on. Hope that clears things up a little bit. Thanks for taking the photos of the handle - much appreciated! Hope all goes well with your restoration. Update of the week! ...ish. Alternator turned up yesterday afternoon; so that's mostly fit. Not quite the right pulley for the belt, but it'll do. The local parts place had a new belt in stock! Slightly too short, with the alternator; which seems to be slightly chunkier -- but shorter -- than the dynamo. It'll do. Make up a little bracket to support the rear of the alternator; I'll probably use most of the old one I took off that supported the dynamo. Re-fit the radiator, and put the coolant back in. Go for a tentative trundle around the industrial estate, maybe. Bracket for back of alternator made. Lopped the ear off the existing bracket for the dynamo, extended the bracket 30mm and stuck the ear back on 10mm taller than it was. Radiator re-fitted, re-installed, and re-filled. And that's as far as I got, because everything I put back in the radiator poured out of the bottom. :undecided: I've taken it to Phoenix radiators in Chorley; preliminary assessment is that it's just the bottom tank has split, but I'll find out more tomorrow. Did seize on the chance to make more noise, though; and drive about a little bit more. At just a trundle, the steering is ...a bit heavy. Once the radiator's in, I'll get a chance to see what it's like when I'm moving a bit faster. Well, the radiator shop just called me back; the bad news is worse than expected. Going to have the radiator re-cored with a modern core; so it should be good for at least another 30 years, hopefully. I suppose I could've gone on a hunt for a similarly sized (, etc.) modern radiator that I could maybe make fit; but at least this way is less hassle, even if it does mean I'm going to be doing a good bit of overtime in the next few weeks. I ran down to the industrial estate where it's sat, today, and wriggled my way in to try get at the MoS plate on the chassis. After failing to get a rubbing, but being very sure I could almost read what was stamped into it; I incredibly carefully started wire-brushing... checking, after a bit, that it wasn't destroying the plate at the same time. And I've cleared it up enough to read at least two bits of information, and partial bits of some more. 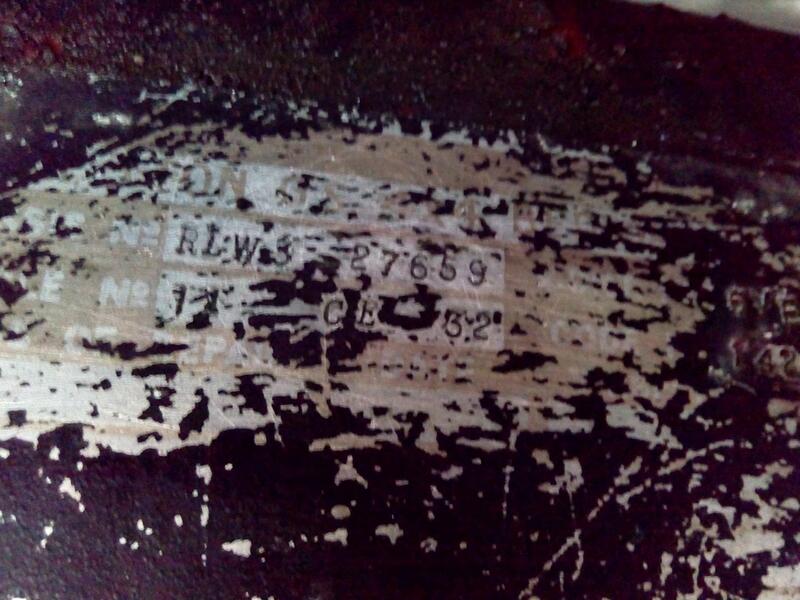 The bits I can read are: The chassis number, and what appears to be a registration number. Looks like I'll be spending some more quality time under the truck with a wire brush, delicately cleaning all the paint off that plate until I can read the whole thing. I hadn't even noticed the other info that the picture picks up... I think I might have to take the storage bin out of the way first, and make my life a little easier. But I know how that goes... I'll spend all day trying to take the storage bin off, because it'll be easier than spending all day trying to ...yeah. You are in the right ball park, 11CE31 was an RL box truck and 11CE65 was an RL fire tender, CE being 1957/58. Well, that's very encouraging to know! Feels like I'm getting closer and closer to my goal; even though I still have a long way to go yet. In other -- and slightly older -- news, I tentatively drove it 'round to the other end of work last week to run it over the weighbridge, just as a matter of curiosity. I know it'll weigh a bit more, when the radiator and all the coolant is back in (I had to bodge a temporary cooling system while it's all out. The temperature gauge and thermostat seem to work marvellously, though! ), and all the rust is removed to be replaced by solid metal... but that doesn't seem a bad weight! Also, she's a loud beastie (I couldn't hear the engine over the carb's whistling. That's probably less obnoxious when there's an actual intake system and air-filter, I imagine. ), but not too bad to steer when moving, even with the soft tyres. An utter pig when nearly at a stand-still, though; to absolutely nobody's surprise. Finally found out what that completely painted-over plate on the side of the body says! "Body, 3 ton, GS, Cargo with winch, FV13105, Cont No. 6/Veh/26156/CB 27A", which would make it (originally) a drop-side body, I think. No remnants of a serial number, though. I should note, I don't believe the deep-scratches are from me trying to clean it up. I used a finer wire wheel than that; and from varying directions. And cleaned off most of the paint covering the MoS plate; resorting to thumb-nail scraping to avoid doing damage to the plate when most of the big flakes of paint were off . Had to stitch together two pictures to cover it all; but no biggie. hiya good to see you are making progress, am I right in saying the engine was ok in the end and didn't have a dropped valve as I was told.